Iowa State University received a huge donation to its ongoing fundraising campaign today. The gift will be used to create a permanent endowed fund to the school’s College of Liberal Arts and Sciences. 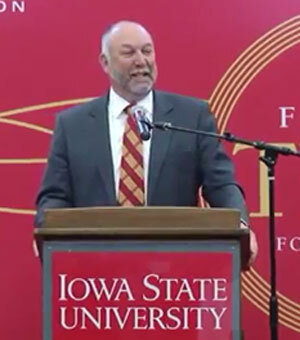 “Since the College of Liberals Arts and Sciences provides core curriculum for students in every major and every program, this gift will impact virtually every student at Iowa State and every student that comes in the future,” Leath says. The ISU campaign seeks to raise $1.1 billion for the university by July 2020. The final valuation of this gift will depend on market considerations at the time the sale of the equity occurs.